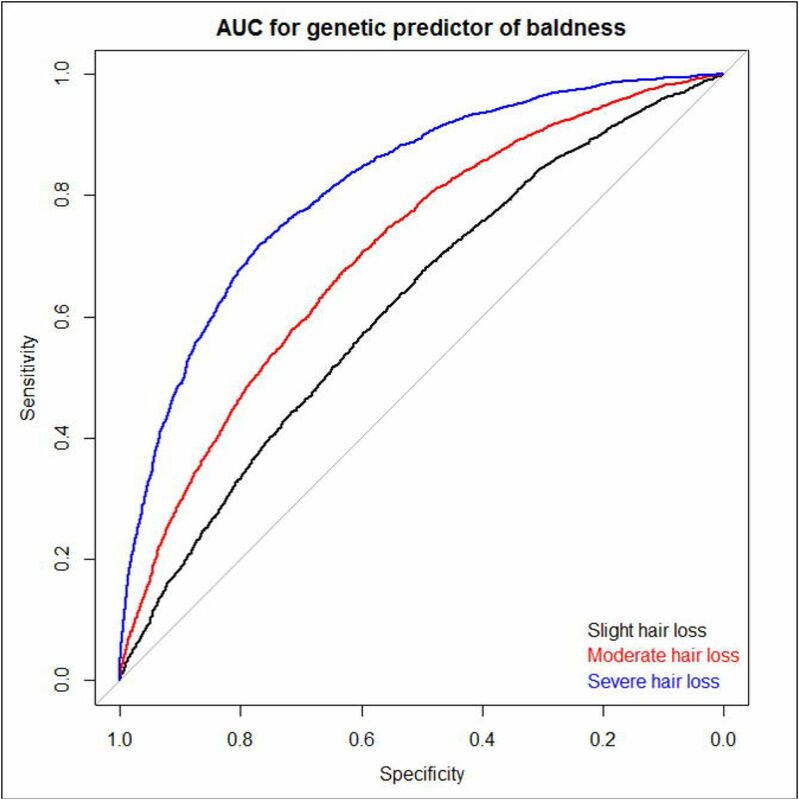 The total proportion of variance in male pattern baldness that can be attributed to genetic factors has been estimated in twin studies to be approximately 80% for both early- and late-onset hair loss [11, 12]. The remaining variance in these twin studies was attributable to non-shared environmental factors. Newer molecular-genetic methods have estimated the single-nucleotide polymorphism (SNP)-based, common-variant heritability of baldness at 13.7% . Molecular methods also indicate some overlap between genetic variants linked to baldness and those linked to phenotypes such as height, waist-hip ratio, age at voice drop in males, age at menarche in females, and presence of a unibrow . GWAS lookups were performed for the 17 top hits reported in Li et al 2012, Heilmann-Heimbach et al. 2016 and Liu et al. 2016 [14, 15, 18]. Hamilton JB. Patterned loss of hair in man: types and incidence. Annals of the New York Academy of Sciences. 1951;53(3): 708-28. doi: 10.1111/j.1749-6632.1951.tb31971.x. Alfonso M, Richter-Appelt H, Tosti A, Viera MS, García M. The psychosocial impact of hair loss among men: a multinational European study. Current Medical Research and Opinion. 2005;21(11): 1829-36. doi: 10.1185/030079905X61820. Cash. The psychosocial consequences of androgenetic alopecia: a review of the research literature. British Journal of Dermatology. 1999;141(3): 398-405. doi: 10.1046/j.1365-2133.1999.03030.x. Cremers RG, Aben KK, Vermeulen SH, den Heijer M, van Oort IM, Kiemeney LA. Androgenic alopecia is not useful as an indicator of men at high risk of prostate cancer. European Journal of Cancer. 2010;46(18): 3294-9. doi: http://dx.doi.org/10.1016/j.ejca.2010.05.020. Zhou CK, Levine PH, Cleary SD, Hoffman HJ, Graubard BI, Cook MB. Male Pattern Baldness in Relation to Prostate Cancer–Specific Mortality: A Prospective Analysis in the NHANES I Epidemiologic Follow-up Study. American Journal of Epidemiology. 2016;183(3): 210-7. doi: 10.1093/aje/kwv190. Shahar E, Heiss G, Rosamond WD, Szklo M. Baldness and Myocardial Infarction in Men: The Atherosclerosis Risk in Communities Study. American Journal of Epidemiology. 2008;167(6): 676-83. doi: 10.1093/aje/kwm365. Trieu N, Eslick GD. Alopecia and its association with coronary heart disease and cardiovascular risk factors: A meta-analysis. International Journal of Cardiology. 2014;176(3): 687-95. doi: dx.doi.org/10.1016/j.ijcard.2014.07.079. Richards JB, Yuan X, Geller F, Waterworth D, Bataille V, Glass D, et al. Male-pattern baldness susceptibility locus at 20p11. Nat Genet. 2008;40(11): 1282-4. Nyholt DR, Gillespie NA, Heath AC, Martin NG. 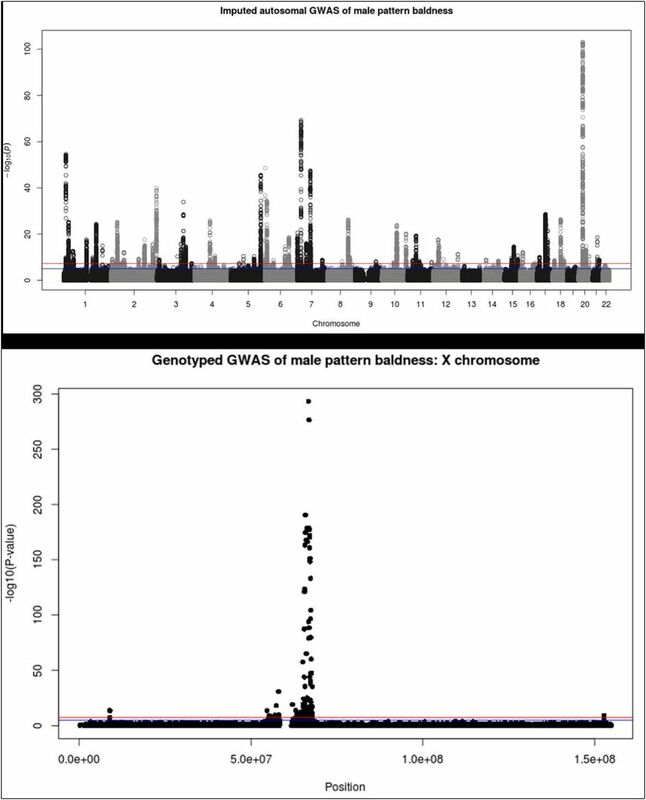 Genetic Basis of Male Pattern Baldness. Journal of Investigative Dermatology. 2003;121(6): 1561-4. doi: 10.1111/j.1523-1747.2003.12615.x. Rexbye H, Petersen I, Iachina M, Mortensen J, McGue M, Vaupel JW, et al. Hair Loss Among Elderly Men: Etiology and Impact on Perceived Age. The Journals of Gerontology Series A: Biological Sciences and Medical Sciences. 2005;60(8): 1077-82. doi: 10.1093/gerona/60.8.1077. Pickrell JK, Berisa T, Liu JZ, Segurel L, Tung JY, Hinds DA. Detection and interpretation of shared genetic influences on 42 human traits. Nat Genet. 2016;48(7): 709-17. doi: 10.1038/ng.3570. Heilmann-Heimbach S, Hochfeld LM, Paus R, Nöthen MM. Hunting the genes in male-pattern alopecia: how important are they, how close are we and what will they tell us? Experimental Dermatology. 2016;25(4): 251-7. doi: 10.1111/exd.12965. Heilmann S, Brockschmidt FF, Hillmer AM, Hanneken S, Eigelshoven S, Ludwig KU, et al. Evidence for a polygenic contribution to androgenetic alopecia. British Journal of Dermatology. 2013;169(4): 927-30. doi: 10.1111/bjd.12443. Liu F, Hamer MA, Heilmann S, Herold C, Moebus S, Hofman A, et al. 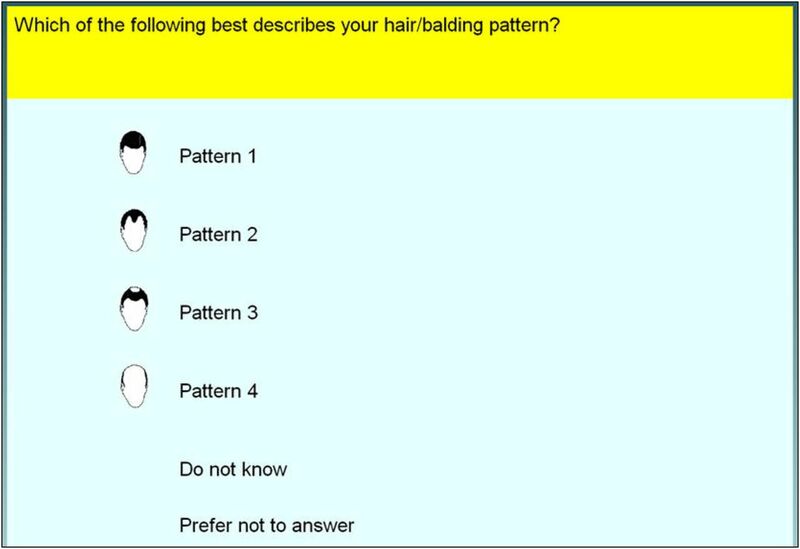 Prediction of male-pattern baldness from genotypes. Eur J Hum Genet. 2016;24(6): 895-902. doi: 10.1038/ejhg.2015.220. Hébert JM, Rosenquist T, Götz J, Martin GR. FGF5 as a regulator of the hair growth cycle: Evidence from targeted and spontaneous mutations. Cell. 1994;78(6): 1017-25. doi: http://dx.doi.org/10.1016/0092-8674(94)90276-3. Adhikari K, Fontanil T, Cal S, Mendoza-Revilla J, Fuentes-Guajardo M, ChaconDuque J-C, et al. A genome-wide association scan in admixed Latin Americans identifies loci influencing facial and scalp hair features. Nat Commun. 2016;7. doi: 10.1038/ncomms10815. Sorokin AV, Chen J. MEMO1, a new IRS1-interacting protein, induces epithelialmesenchymal transition in mammary epithelial cells. Oncogene. 2013;32(26): 3130-8. doi: 10.1038/onc.2012.327. Rademakers R, Cruts M, van Broeckhoven C. The role of tau (MAPT) in frontotemporal dementia and related tauopathies. Human Mutation. 2004;24(4): 277-95. doi: 10.1002/humu.20086. Billuart P, Bienvenu T, Ronce N, des Portes V, Vinet MC, Zemni R, et al. Oligophrenin-1 encodes a rhoGAP protein involved in X-linked mental retardation. Nature. 1998;392(6679): 923-6. Karlsson L, Bondjers C, Betsholtz C. Roles for PDGF-A and sonic hedgehog in development of mesenchymal components of the hair follicle. Development. 1999;126(12): 2611-21. Medland SE, Nyholt DR, Painter JN, McEvoy BP, McRae AF, Zhu G, et al. Common Variants in the Trichohyalin Gene Are Associated with Straight Hair in Europeans. The American Journal of Human Genetics. 2009;85(5): 750-5. doi: http://dx.doi.org/10.1016/j.ajhg.2009.10.009. Adaimy L, Chouery E, Mégarbané H, Mroueh S, Delague V, Nicolas E, et al. Mutation in WNT10A Is Associated with an Autosomal Recessive Ectodermal Dysplasia: The Odonto-onycho-dermal Dysplasia. The American Journal of Human Genetics. 2007;81(4): 821-8. doi: http://dx.doi.org/10.1086/520064. Hillmer AM, Hanneken S, Ritzmann S, Becker T, Freudenberg J, Brockschmidt FF, et al. Genetic Variation in the Human Androgen Receptor Gene Is the Major Determinant of Common Early-Onset Androgenetic Alopecia. The American Journal of Human Genetics. 2005;77(1): 140-8. doi: http://dx.doi.org/10.1086/431425. Prodi DA, Pirastu N, Maninchedda G, Sassu A, Picciau A, Palmas MA, et al. EDA2R Is Associated with Androgenetic Alopecia. Journal of Investigative Dermatology. 2008;128(9): 2268-70. doi: http://dx.doi.org/10.1038/jid.2008.60. Hirata H, Nanda I, van Riesen A, McMichael G, Hu H, Hambrock M, et al. ZC4H2 Mutations Are Associated with Arthrogryposis Multiplex Congenita and Intellectual Disability through Impairment of Central and Peripheral Synaptic Plasticity. The American Journal of Human Genetics. 2013;92(5): 681-95. doi: http://dx.doi.org/10.1016/j.ajhg.2013.03.021. Davies G, Marioni RE, Liewald DC, Hill WD, Hagenaars SP, Harris SE, et al. Genome-wide association study of cognitive functions and educational attainment in UK Biobank (N=112 151). Mol Psychiatry. 2016;21(6): 758-67. doi: 10.1038/mp.2016.45. König IR, Loley C, Erdmann J, Ziegler A. How to Include Chromosome X in Your Genome-Wide Association Study. Genetic Epidemiology. 2014;38(2): 97-103. doi: 10.1002/gepi.21782. Giles GG, Severi G, Sinclair R, English DR, McCredie MRE, Johnson W, et al. Androgenetic Alopecia and Prostate Cancer: Findings from an Australian Case-Control Study. Cancer Epidemiology Biomarkers & Prevention. 2002;11(6): 549-53. Norwood OT. Male pattern baldness: classification and incidence. South Med J. 1975;68(11): 1359-65. PubMed PMID: 1188424. Marchini J, Howie B, Myers S, McVean G, Donnelly P. A new multipoint method for genome-wide association studies by imputation of genotypes. Nat Genet. 2007;39(7): 906-13. Purcell S, Neale B, Todd-Brown K, Thomas L, Ferreira MAR, Bender D, et al. PLINK: A Tool Set for Whole-Genome Association and Population-Based Linkage Analyses. The American Journal of Human Genetics. 2007;81(3): 559-75. doi: http://dx.doi.org/10.1086/519795. Consortium TGP. An integrated map of genetic variation from 1,092 human genomes. Nature. 2012;491(7422): 56-65. Robin X, Turck N, Hainard A, Tiberti N, Lisacek F, Sanchez J-C, et al. pROC: an open-source package for R and S+ to analyze and compare ROC curves. BMC Bioinformatics. 2011;12(1): 1-8. doi: 10.1186/1471-2105-12-77. Yang J, Benyamin B, McEvoy BP, Gordon S, Henders AK, Nyholt DR, et al. Common SNPs explain a large proportion of the heritability for human height. Nat Genet. 2010;42(7): 565-9. Bulik-Sullivan BK, Loh P-R, Finucane HK, Ripke S, Yang J, Schizophrenia Working Group of the Psychiatric Genomics C, et al. LD Score regression distinguishes confounding from polygenicity in genome-wide association studies. Nat Genet. 2015;47(3): 291-5. doi: 10.1038/ng.3211 http://www.nature.com/ng/journal/v47/n3/abs/ng.3211.html-supplementary-information. Benjamini Y, Hochberg Y. Controlling the false discovery rate: a practical and powerful approach to multiple testing. Journal of the Royal Statistical Society Series B (Methodological). 1995: 289-300. Finucane HK, Bulik-Sullivan B, Gusev A, Trynka G, Reshef Y, Loh P-R, et al. Partitioning heritability by functional annotation using genome-wide association summary statistics. Nat Genet. 2015;47(11): 1228-35. doi: 10.1038/ng.3404.